Remember how all that was needed to convince the entire city of Metropolis that Clark Kent and Superman were different people… was a simple pair of eyeglasses? Well, here is the real world equivalent. Our story opens at the Van Bommel Van Dam Museum in the southeastern Netherlands City of Venlo when, on March 22, 2013, a piece by the late renown Dutch artist, Jan Schoonhoven, disappeared. It was one of 4 pieces stolen at the time from the museum. 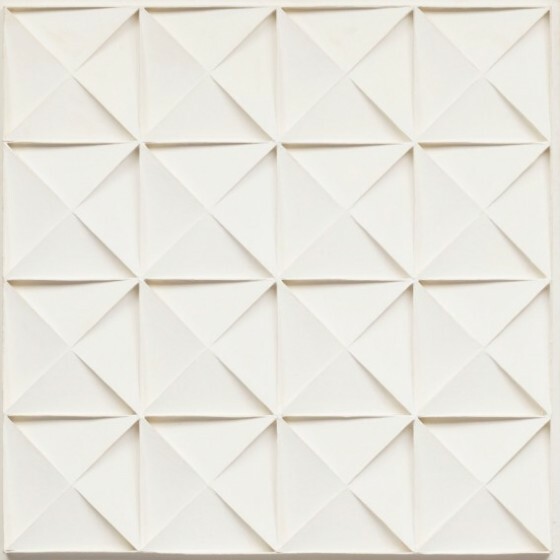 The piece, titled “R69-32,” was a white rectangular relief consisting of papier-mâché triangular blocks. The piece was immediately reported as stolen to the police authorities and to the Art Loss Register. The Art Loss Register is the world‘s largest database of stolen art. Fine art dealers, who fail to first check with the Art Loss Register on the bonafides of works that come across their desks, do so at extreme financial risk. You guessed it. The art thief altered that one digit. Oh, the damage one can do with a pencil eraser. That negligible alteration was apparently enough to fool a whole lot of people because, despite the report from the Art Loss Register, Sotheby’s, and the experts it retained to pass on the piece, decided that their piece was not the stolen Schoonhoven. The piece was sold at auction on June 27, 2013, for $285,000. Paul Van Rosmalen, an executive at the Borzo Modern Art and Contemporary Gallery, 1 of the 2 purchasers of the piece, caught onto the scheme and detected the fraud. Sometimes it doesn’t take much to fool the provenance experts. But then again, when dealers and vendors are desperate for product to sell and commissions to make, sometimes even the experts see only what they want to see. Maybe Clark Kent’s eyeglasses could have helped.